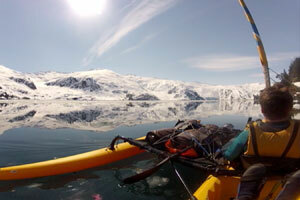 Alaska Wild Guides – Backcountry Kayaking Tours in Glacial Waters from Pangeality Productions on Vimeo. Are you thinking about going on an Alaskan glacier tour and want to learn about the services provided at Alaska Wild Guides? If so, you’re in luck! Below we offer up details on the excursions, equipment, and adventures you are going to have. Please contact our team with any questions you have in regards to booking. 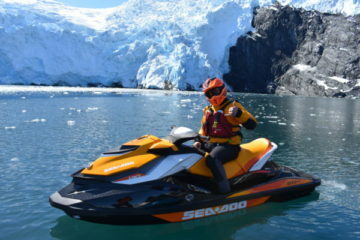 Our Glacier Jet Ski tours are conducted on top of the line SEADOO GTI’s 130, which are environmentally efficient and carry enough power to put speed curls in your hair. Climb aboard and get ready for an adventure of a lifetime. These boats are very stable and can accommodate up to two passengers so parents can take a child with them between the ages of 8 and 16. 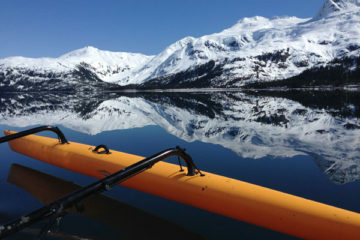 Whittier is the gateway to the lovely Prince William Sound, home to amazing glaciers , wildlife and majestic beauty. Join us for a small group experience like no other. We’ll provide you with all the gear you’ll need to have a fantastic time. Check out some pics of previous summertime excursions here. We feature Hobie Cat Tandem Island kayaks that move effortlessly under sail, and are comfortable and efficient under pedal power. Sit back and relax in the cushioned, recumbent seats, hands free to drink, snack, or take photos. These are extremely stable boats, so you won’t have to worry about tipping over in cold water! Click here to see pictures of our recent winter glacier excursions. 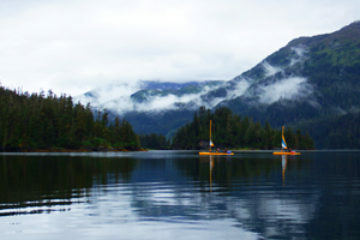 Take a water taxi deep into the Prince William Sound to the prime whale watching grounds in the whole state. We’ll camp on remote beach locations, eat fresh from the ocean gourmet meals, campfires on the beach at night and paddle among the feeding humpback whales during the days. We’ll explore waterfalls, and watch the waters around us “boil” with salmon. We may see orcas, sea lions, sea otters, eagles, black bears, and innumerable water birds. In the end we’ll take a water taxi back to Whittier. 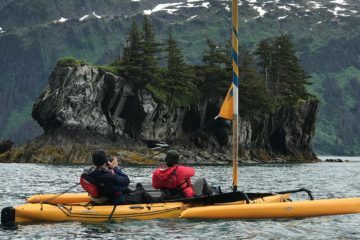 Our kayaks are unique for Alaskan tours, with an 18′ tall mast and 90 sq.ft. of sail, we can zip along at up to 12 knot speeds with no effort, or leisurely pedal the “mirage drive” (think recumbent bike) at over 4 knots. This leaves your hands free to take photos or eat snacks, all while moving twice as fast as paddling with half the effort. The seats are very comfortable and laid back, with easy use of all features. Pontoons on either side provide incredible stability in all weather conditions and trampolines on either side can hold gear or be laid on to relax and enjoy the ride while under sail. Cutting edge technology combined with rugged guide skills make for a safe and adventurous tour you will forever be glad you took! Four days of exploring Alaska's great outdoors is just what the doctor ordered. 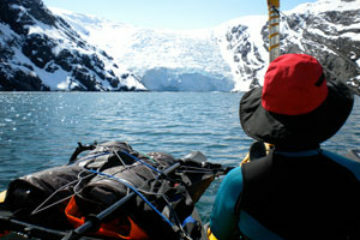 Breakaway from a fast paced world and come adventure with us on our sailing kayaks into Blackstone Bay, a beautiful home of several tidewater glaciers. 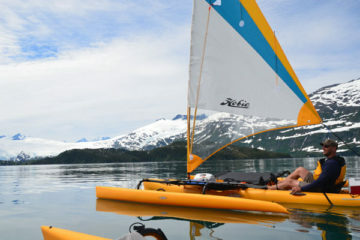 Three days of sailing in the Prince William Sound on Hobie Cat Mirage Island Kayaks is an experience you'll talk about for years to come. Camping in the lush forests and exploring tide water glaciers is a true Alaskan adventure. Multi-Day Tours: 50% of tour price is due at time of booking and the other 50% is due at the start of the tour. 95% refund if cancelled within 5 days of booking. 50% is refundable up to 30 days prior to trip departure and 100% is non-refundable within 30 days of trip departure. Day Tours: Payment is due in full at the time of reservation. 100% refund if cancelled 30 days or more prior to tour date, 50% refund if cancelled 10 or more days prior to the tour date, no refunds within 10 days of the tour date. If Alaska Wild Guides has to cancel a day tour for any reason whatsoever, and rescheduling is not possible, a 100% refund will be provided.